Yeah I was having huge trouble with resizing screens and AI. I know I'll probably just have to use a camera for each resolution or something, and I want to fix that after the jam if I keep the downloadable version. 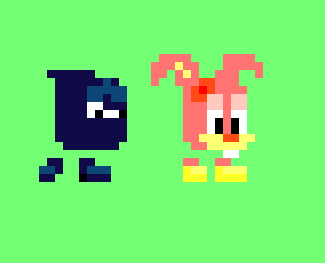 My next steps are gonna be improve gameplay, add characters, add more modes and port to mobile. Nice! More characters? Really nice! :) Also. a mobile port of this would be awesome! Neat game. The music is nice and the sound effects work well. I like the detailed animations of the player character. Knocking the balls into the hoop is quite fun, and surprisingly challenging. My best score was 6. Nice little game. Multiplayer on the same keyboard would be cool. Keep up the good work! Nice idea never thought about it. Gonna add it to my backlog. Thanks! 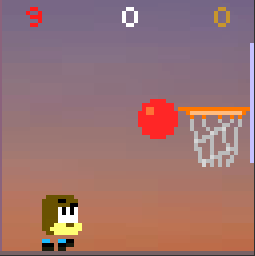 Loved this game, the main character is so cute =p hehe The game is really good, it remind an old flash game I used to play, really cool, simple but I had a lot of fun playing, and I love basketball so this makes the game more appealing to me ! The main character has some small animations that are very subtle but looks so cool, great game ! Very nice game! It would be cool if there was a difficulty curve as the time passes, but it is fun to play anyway. Good work! Ive added your suggestion to my backlog. Thank you very much. I only see a .exe file + a folder of assets and .dlls in the zip download. Can you publish an actual .app for Mac users? I've added a html5 version and hope you enjoy it. I could try and build a mac version but I dont have access to Mac so that could be frustrating for you. Let me know if I can help you with anything, as your input helped me improve as dev. Thank you. Awesome! Thanks for the web build. This was cute and good. I like the little guy's expressions. Nice gameplay, simple but addictive!